But the Ant went on its way and continued its toil. 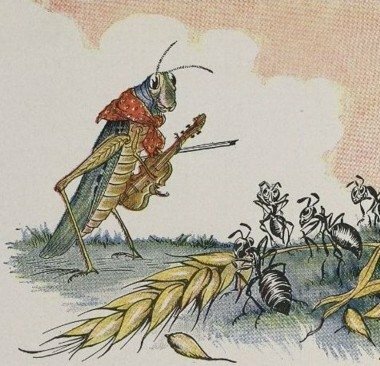 When the winter came the Grasshopper had no food and found itself dying of hunger, while it saw the ants distributing every day corn and grain from the stores they had collected in the summer. Dying, the Grasshopper knew: It is best to prepare for the days of necessity. Through various retellings over the years this simple and straightforward moral has become badly distorted. This was especially shown in the 1934 Disney short film “The Grasshopper and the Ants”. The film ended with the ants feeling sorry for the grasshopper, bringing him in, feeding and caring for him. Too many believe this is what would really happen, either by ‘some government agency’ or neighbors who did take the time to “lay up food for the winter”. Planning ahead and preserving the harvest in preparation for the dark days of winter was the norm from long before the time of Aesop until as recently as two generations ago. Yet somehow today the concept of actively preparing for times of need has been labeled as hoarding, fringe, or extreme. *Aesop is believed to be a Greek writer who is variously described as both legendary and historical. He was said to have lived in the six century B.C. perhaps as a Phrygian slave. 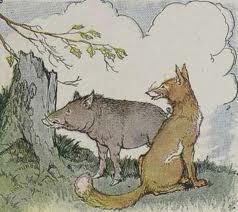 There is debate as to whether or not Aesop actually wrote the fables, some question whether he even existed. Although the origin of Aesop’s fables may be shrouded in mystery, they were retold over generations, and finally transcribed by Babrius, in the second century A.D. Throughout the years, there have been many versions, in many cultures, used to teach morals to people of all ages.